heinnews – Did Bamberg purposely miss deadline with Massey to save money? Did Bamberg purposely miss deadline with Massey to save money? Jeremiah Massey will be a big help in Bamberg’s chances to win the Beko BBL for a fourth straight season. This may be a bit far-fetched but it seems like a possibility. Maybe Brose Baskets Bamberg purposely missed the deadline to sign Jeremiah Massey to save some money. Usually the Brose Baskets Bamberg management knows its stuff and is totally on the ball. And it seems highly unlikely that general manager Wolfgang Heyder would not know of the deadline to sign a player for the Turkish Airlines Euroleague. So, how can it be that Massey gets signed but is not eligible to play until the eighth game day of the Euroleague? And that Bamberg announced throughout social media that he’s available for the next Top 16 game? How can a mistake like that be made? Of course it’s clear that Jeremiah Massey, a 30-year-old athletic power forward, is pretty much exactly what Bamberg needed on their team. Could he be an eventual replacement for Sharrod Ford? That could have been suggested early on in the season. But it seems that Ford – also an athletic power forward – has picked up his game the past three or four weeks. One part of the problem is Germany’s foreigners rules. AJ Ogivily was brought on in the off-season to be Bamberg’s starting center but he missed the first two months of the season with groin surgery. Once the Australian big man was finally back at practice and deemed fit, he was unable to get playing time – heck, he wasn’t even on the Bamberg game roster in the Beko BBL. The problem – too many non-Germans with the three-time reigning champs. For those unfamiliar with the regulations in Germany, Beko BBL teams must have six Germans on an 11-man or 12-man game roster. And with German centers Maik Zirbes and Philipp Neumann both unable to guard the more athletic power forwards in the German league, Bamberg coach Chris Fleming had no choice but to keep Ford in the squad – even though Bamberg were playing what amounted to be an expected “easy” team like Phoenix Hagen, missing a chance to give Ogivly a chance to learn the system in the game. The other non-Germans on the 11-man roster for the Hagen game were Teddy Gipson, John Goldsberry, Bostjan Nachbar, Casey Jacobsen and Anton Gavel. The situation could likely ease up slightly some time in January if Gavel – a Slovakian who began his career in Germany in 2001 and played in the BBL since then save for two seasons in Spain and one in Greece – can, as expected, receive a German passport early in 2013. Then the 2012 Beko BBL Defensive Player of the Year would no longer be counted as a non-German – easing Bamberg’s personnel situation. So, what about the money? Why may Bamberg have saved money? Well, considering that Bamberg have already achieved their Euroleague goal this season by finally reaching the Top 16 – with a team that pails in comparison to at least last season’s if not even the last two Bamberg teams – perhaps Heyder and company are saying it will be a real challenge to finish in the top four of a Top 16 group with the likes of CSKA Moscow, Real Madrid, Panathinaikos, Zalgiris Kaunas, Unicaja Malaga, Anadolu Efes Istanbul and Alba Berlin. 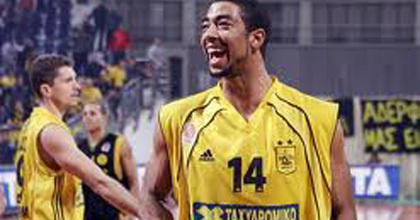 But they knew that a player of Massey’s ability and experience (he played for Real Madrid in the Euroleague in 2008-09 and Lokomotiv Kuban in the Eurocup in 2010-11) would be a hot commodity after finishing his six-week contract with Russian Eurochallenge team Krasnie Krilya Samara, which ended on December 26, 2012. And they knew that they needed a player like him in the squad, so they went after him – as he will be a big help in Bamberg’s hopes of winning a fourth straight Beko BBL league title and German Cup crown. … maybe Bamberg paid less for the Detroit native and former Kansas State star knowing that Massey would miss the first seven games of the Top 16 and they wouldn’t get as much out of him had they signed him a couple days earlier. With away games at Alba Berlin, Panathinaikos and Unicaja (likely three contenders for the fourth and final Quarterfinal Playoffs spot) among the first seven games, Bamberg will need to beat at least two if not all three of those teams at home to reach the playoffs. And Massey will be in the line-up to help. Plus, by then Massey would have gotten used to the system in the BBL – as Game Eight at home against Unicaja is not until February 21, giving him nearly two months to fit in. Regardless of how much money Bamberg may have saved in the move – if it went down like that – those euros will be invaluable if Brose Baskets elect to bring in a guard, which may also be the case. Real conspiracy theorists could even go as far as to say that Bamberg announced on social media that Massey was eligible to see if they could sneak it by the Euroleague and then still say he should have been able to play. But we don’t want to go there. Still, is it out of the realm of possibility that Bamberg actually saved some money by signing Massey a couple days later? It would seem not. Or, maybe Heyder and his Co just made an honest mistake. Could be as well. If Sharrod Ford’s trajectory can be used as a model, it won’t be until about week eight that Massey would start making much of an impact anyways. In all seriousness, I don’t think this sounds too conspiracy-y. As you mentioned, the Brose boys are usually on top of things, and this just doesn’t seem like something that would have slipped through the cracks. Unless: they really were simply scrambling to sign Massey as the witching hour was approaching, in which case Scenario B (using social media to try to glaze over poor timing) also seems plausible. Well laid-out, either way. I didn’t know that Gavel is that close to German citizenship. Looks like we’ve got another Brose lifer on our hands.